A piece of Aotearoa technology is being used to support Antarctic scientists to capture fascinating footage of life beneath the ice in McMurdo Sound in the Ross Sea. 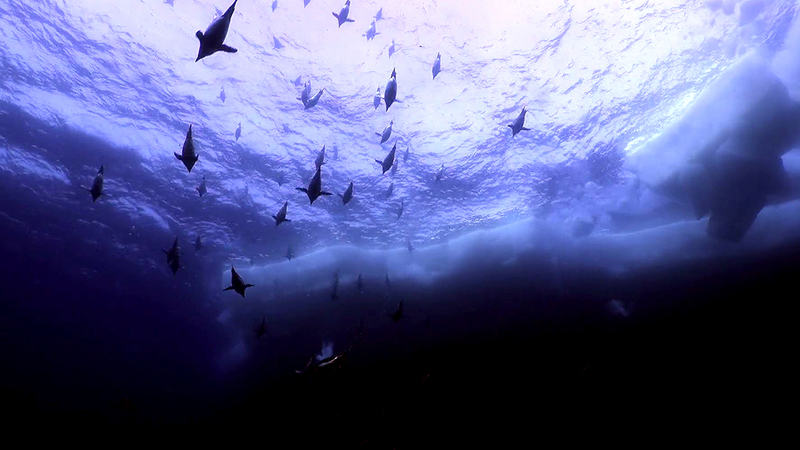 The stunning footage is just a snippet of what was recorded during 21 hours underwater this season. This year, as part of her research into the Ross Sea region Marine Protected Area, Dr Regina Eisert partnered with Boxfish Research to study Type-C killer whales with a new kind of remotely operated vehicle (ROV). It includes Adélie penguins, whales, Weddell seals, bright red octopus and a glowing ctenophore. University of Canterbury marine mammal expert, Eisert says the technology is a game changer for marine science, as it is safer and has a wider scope than can be achieved by scuba divers. “Before this, I feel that my view of marine animals was quite biased. We would observe penguins waddling along and seals sleeping on the ice and whales on the surface, but they spend most of their lives in the water and this is the important stuff to see. “We got confirmation of the overlap between penguins and Type-C killer whales, the ROV captured unconcerned penguins freely entering and exiting the water in the presence of theses whales, and being ignored by them,” she says. The Boxfish ROV carried out 15 dives, gathered 21 hours of footage and reached depths of 210 metres this season.